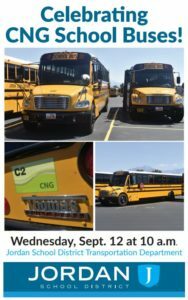 Local lawmakers, city leaders, school district officials, students, and clean air advocates will come together on Wednesday, September 12, to celebrate Jordan School District’s investment in the state’s largest fleet of CNG (compressed natural gas) school buses. This year, the Jordan School District added 36 new CNG buses to its fleet, bringing the total number to a record 105. Utahns rank air quality among their highest concerns. Studies have concluded that the younger a person is, the more susceptible that person is to the dangers of diesel exhaust fumes, resulting in increased health risks associated with respiratory disease, cancer, and heart disease. The concentration of numerous idling diesel school buses around schools contributes to poor air quality and impacts the health of Utah’s school children and other members of the community. Diesel exhaust also disproportionately affects school children and bus drivers as the fumes often enter the passenger compartment. Throughout the 41 school districts and charter schools in Utah, school buses travel approximately 32 million miles each school year. This equates to a significant amount of diesel exhaust, which leads to the formation of both wintertime particulate air pollution, and summertime ozone pollution. CNG buses emit 40-86% less particulate matter into the air compared to old diesel school buses. 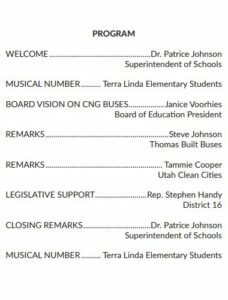 Numerous efforts have been made over the past several years to remove older diesel school buses in Utah and replace them with clean fuel alternatives such as CNG, clean diesel, electricity, propane, or hybrid capability. One CNG school bus saves the equivalent of the emissions produced by roughly 35 passenger cars on the road. No stranger to the efforts in getting cleaner school buses in the state is Representative Steve Handy (R-Layton). “The Jordan School District has been a leader in clean-fuel school buses and with the Volkswagen settlement funds, they picked up twelve more. Kudos to them for leading the way.” Representative Handy has long been an advocate on Capitol Hill for Utah’s school children when it comes to finding the funds to help the school districts offset some of the costs incurred by upgrading from old, dirty diesel buses, to cleaner alternative fuels. Governor Herbert announced last year that the state will use approximately $7.5 million in funds from the Volkswagen Settlement to upgrade diesel school buses to a cleaner burning alternative fuel. Wednesday’s event will be held at Jordan School District Transportation, 8370 S. 4300 W. in West Jordan at 10am. Utah Clean Cities (UCC) has been working for clean air strategies for over 25 years in Utah. They have worked closely with the Governor’s Office of Energy Development, Salt Lake City, Department of Environmental Quality, Utah cities and towns, businesses and private enterprises, along with the national network of the Department of Energy Development Clean Cities programs. UCC offers the most up-to-date technical assistance and grant support opportunities for fleets. 2017 Utah Clean Cities Coalition - All rights reserved.